Life Fitness, Nautilus, Hammer Strength, Concept 2. 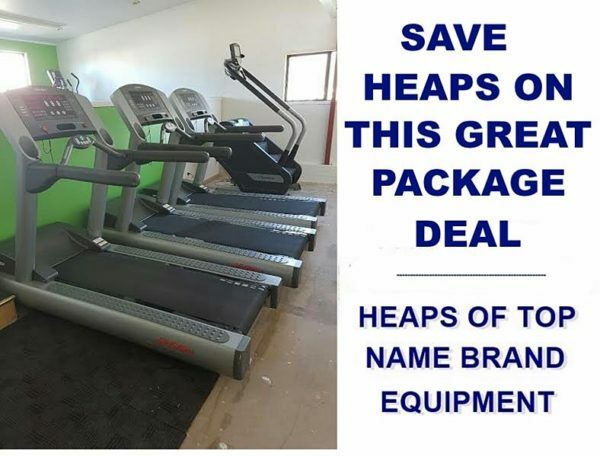 A sensational package deal jam packed with high quality name brand equipment, but you might need to be quick to secure this one. The equipment is currently located in New Zealand and is in fabulous condition – just perfect for someone looking to fit out their own fitness facility on a budget. Contact us straight away to take advantage of this package deal opportunity before someone else beats you to it! 1 x Life Fitness Signature Series Seated Leg Curl – Reconditioned. 1 x Hammer Strength Incline Chest Press – Reconditioned. 1 x Life Fitness Incline Chest Press Pro 1 – Reconditioned. 1 x Round Rubber Barbell, 5 kg to 50 kg in 5 kg increments with rack (11 pieces). 3 x Life Fitness 95Ti Treadmill – Fully Reconditioned. 2 x Life Fitness 95Xi Cross Trainer – Fully Reconditioned. 2 x Life Fitness 95Ci Upright Bike – Fully Reconditioned. 1 x Nautilus V2 Vertical Trainer – New. 2 x Concept 2 Model D Rower – New. 1 x Star Trac Max Rack – Reconditioned. 1 x Hammer Strength Pullover – Reconditioned. 1 x Life Fitness Cable Crossover – Reconditioned. 1 x Life Fitness Fit 1 Cable Motion Machine – Reconditioned. 1 x Life Fitness Pro 2 Leg Press – Reconditioned. 1 x Life Fitness Pro 2 Seated Row – Reconditioned. 1 x Life Fitness Pro 2 Lat Pulldown – Reconditioned. 1 x Life Fitness Signature Series Shoulder Press – Reconditioned. Buy Full Gym Fit Out online. If you are interested in the Full Gym Fit Out for sale, feel free to enquire above.